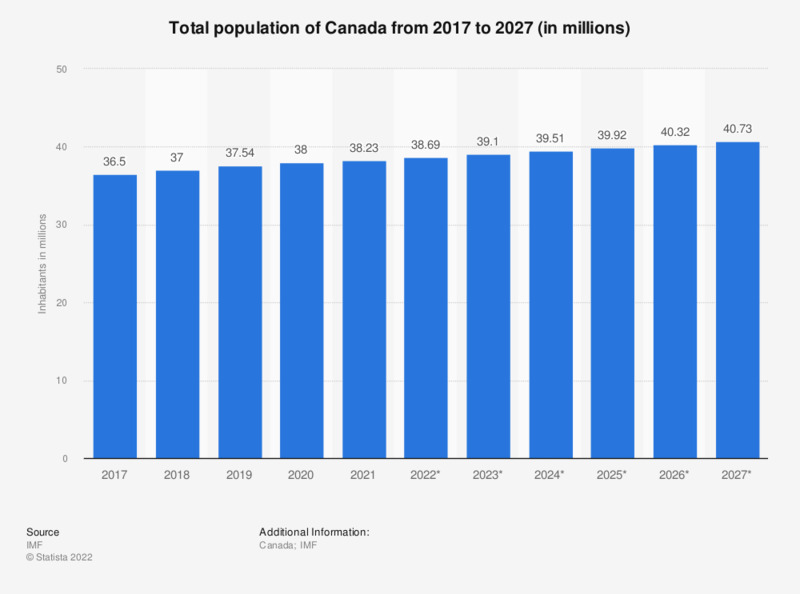 The statistic shows the total population in Canada from 2014 to 2018, with projections up until 2024. In 2018, the total population in Canada amounted to about 36.99 million inhabitants. Canada ranks second among the largest countries in the world in terms of area size, right behind Russia, despite having a relatively low total population. The reason for this is that most of Canada remains uninhabited due to inhospitable conditions. Approximately 90 percent of all Canadians live within about 160 km of the U.S. border because of better living conditions and larger cities. On a year to year basis, Canada’s total population has continued to increase, although not dramatically. Population growth as of 2012 has amounted to its highest values in the past decade, reaching a peak in 2009, but was unstable and constantly fluctuating. Simultaneously, Canada’s fertility rate dropped slightly between 2009 and 2011, after experiencing a decade high birth rate in 2008. Standard of living in Canada has remained stable and has kept the country as one of the top 20 countries with the highest Human Development Index rating. The Human Development Index (HDI) measures quality of life based on several indicators, such as life expectancy at birth, literacy rate, education levels and gross national income per capita. Canada has a relatively high life expectancy compared to many other international countries, earning a spot in the top 20 countries and beating out countries such as the United States and the UK. From an economic standpoint, Canada has been slowly recovering from the 2008 financial crisis. Unemployment has gradually decreased, after reaching a decade high in 2009. Additionally, GDP has dramatically increased since 2009 and is expected to continue to increase for the next several years.